According to the the latest U.S. 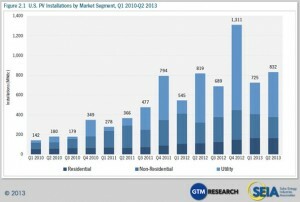 Solar Market Insight Report the United States installed 832 megawatts of solar PVs in the second quarter of this year. 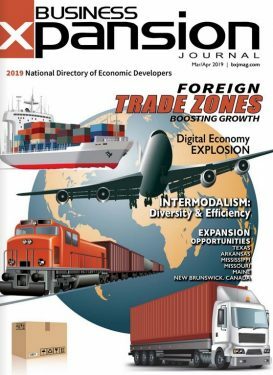 The report issued by GTM Research and the Solar Energy Industries Association publish the report, which analyzes solar power markets in the United States, with strategic state-specific data for 28 U.S. states and the District of Columbia. 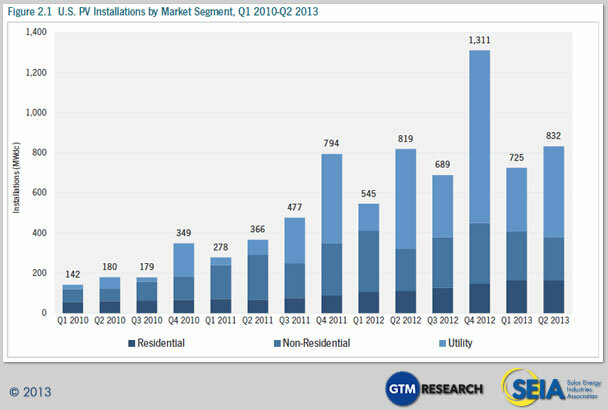 Showing continued growth in the solar market, this quarter’s report finds that the U.S. installed 832 megawatts (MW) in Q2 2013, representing 15 percent growth over the first quarter of this year. It was solar’s second best quarter ever.